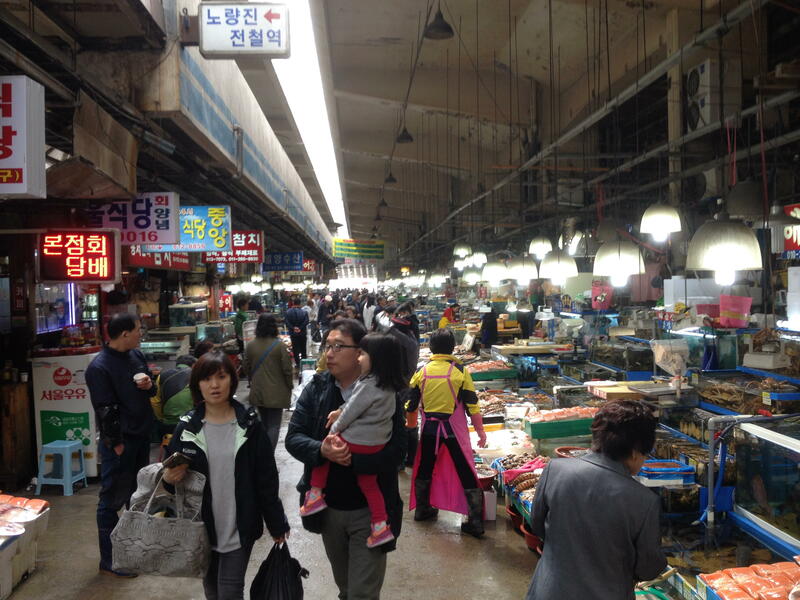 It’s amazing that we’ve taken 18 months to get to the Noryangjin Fish Market. 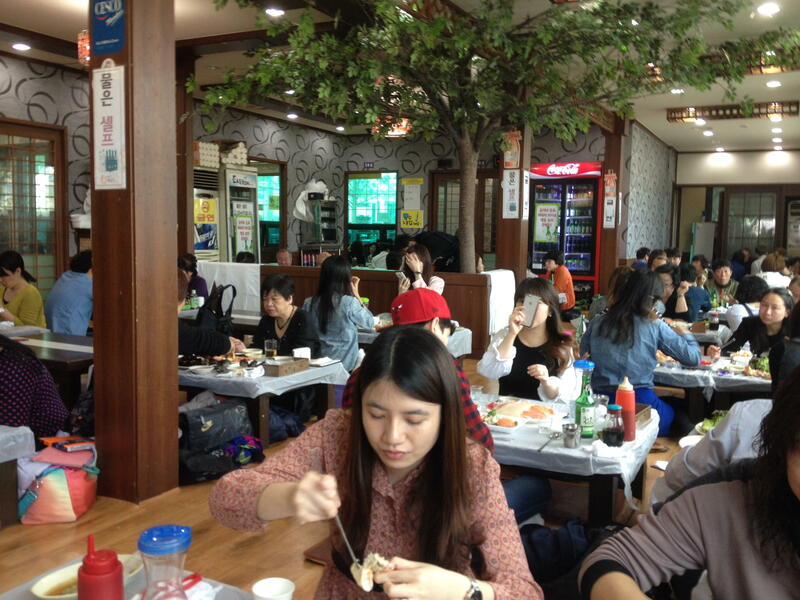 I mean, some people go there on their first day in Seoul. Maybe that’s one of the nice things about living somewhere – no rush! (Of course, “no rush” can turn into “never got around to it” if you’re not careful). But, as part of my continuing plan to Do Something Every Weekend, we finally went yesterday (& at A’s suggestion, too!). 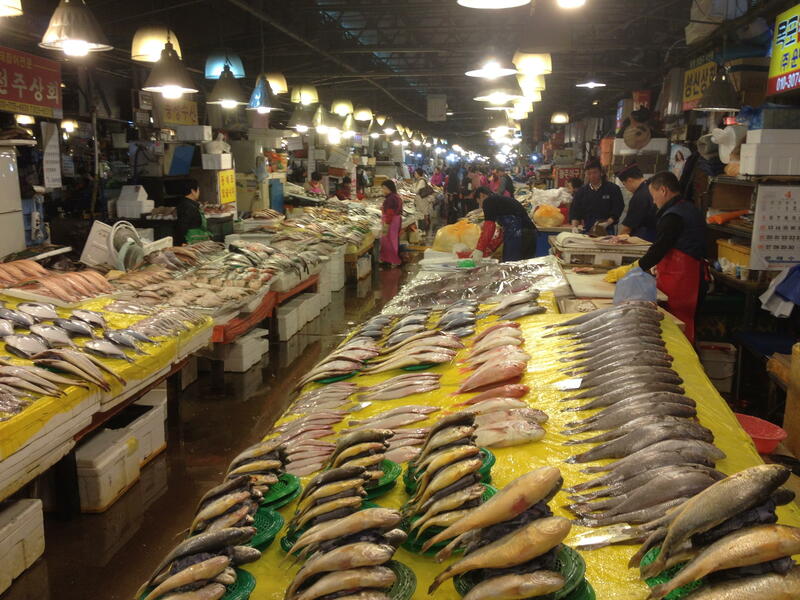 It’s easy to get to – either take the metro (Line 1 to Noryangjin station) or driving over the Hangang Bridge (Hangang-daegyo 한강 대규), right onto Noryangjin-ro and then look for the signs “Fish Market”. It’s a huge place, a cavernous concrete warehouse with a 2nd story along one side, which is where most of the restaurants are. It was surprisingly clean and lacking in fish-smell. When you enter, you’re on the aisle along one side of the place, with the restaurants on the balcony above you. 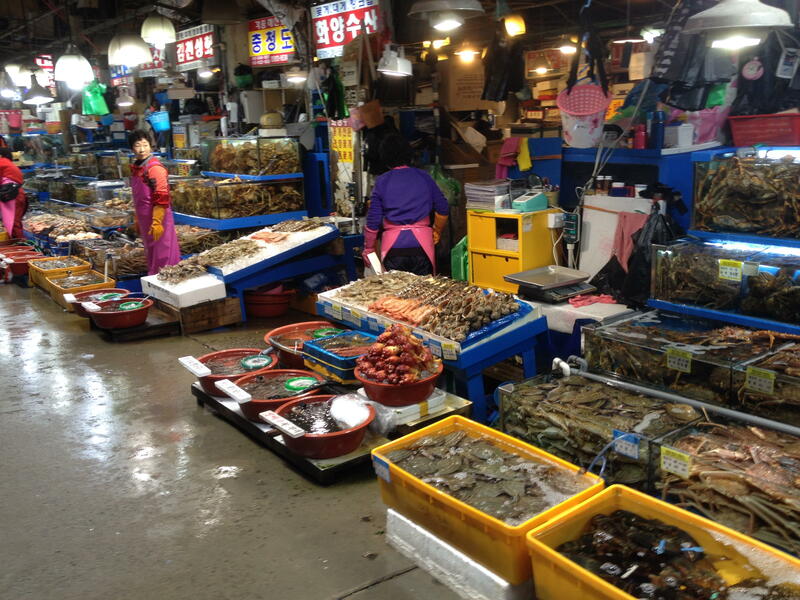 The first couple of aisles are mostly shellfish, crustaceans, sea urchins, eels, squid & octopus, etc. Tentacles longer than my arm! There’s no refrigeration — everything is kept on ice. 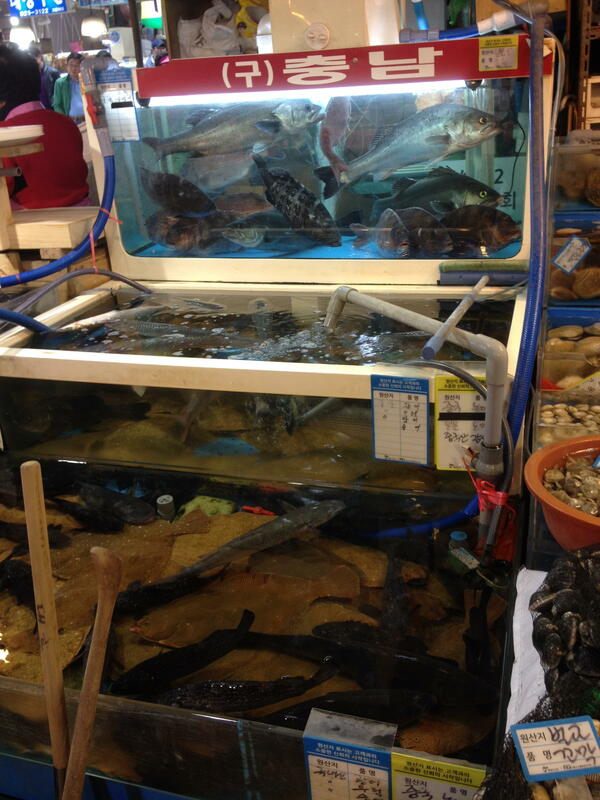 While most of the fish is obviously very fresh, some of it is still alive, in big tanks, as are the crabs & lobsters. Pick your fish, and they spike it & scoop it out of the tank. The shellfish, and sometimes the crabs too, are generally in large plastic tubs with aquarium pumps keeping the water full of oxygen. Nice bit o’ salmon tail, missus? The way the restaurants work is that you buy the seafood for your lunch, and the restaurant cooks it for you. 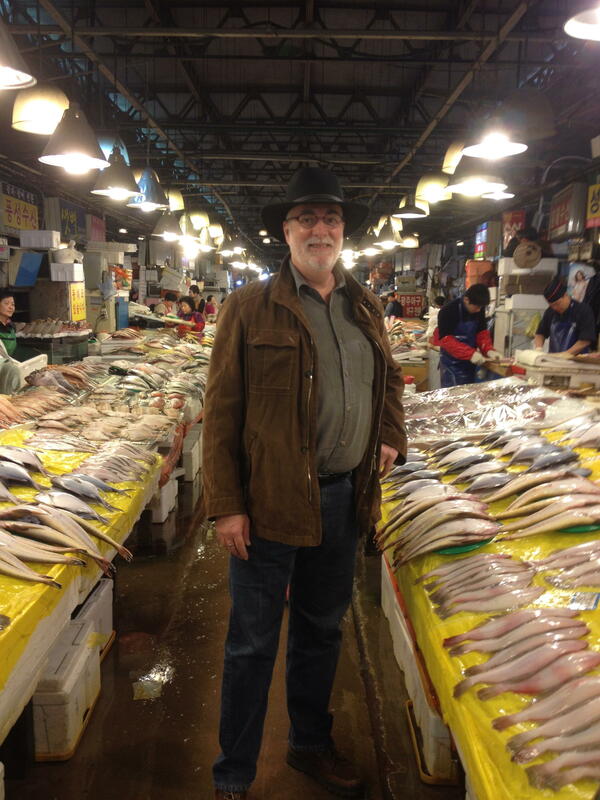 We bought a red fish that looked kind of like dorade and a couple of flat white fish that looked a bit like sole. 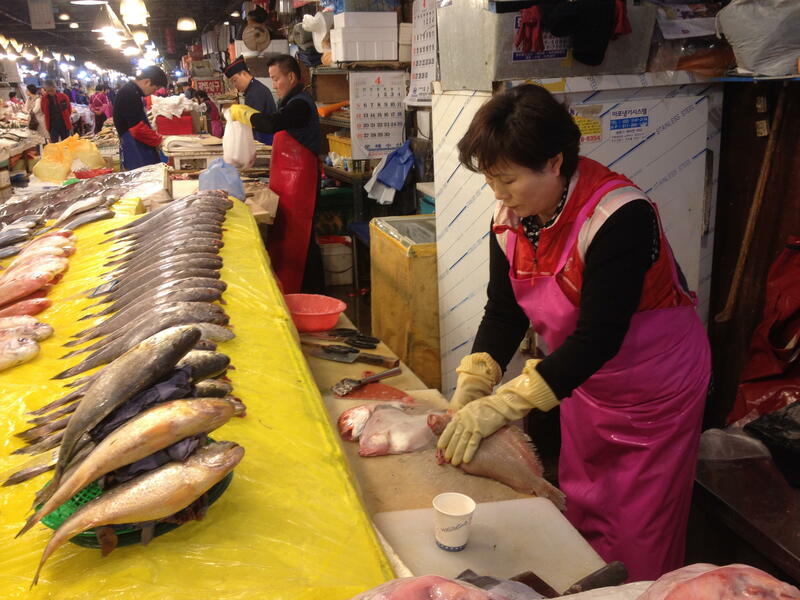 The lady there scaled & cleaned the fish for us, and led us towards the restaurants. But we were quickly intercepted by a tout, who passed us to a guide, who took us to the restaurant. The white fish was steamed & served with a spicy chili & onion sauce on top (A. scraped of most of hers, which meant more sauce for me! ), while the red fish was grilled. We didn’t have much by way of side dishes or rice — I guess you have to order them, and we didn’t. Just as well, as we’d only intended to cook one of the white fish, but forgot & so there was a bit more fish than we’d planned on. Yes, it is back there..
After lunch, we bought our giant prawns & large clams. 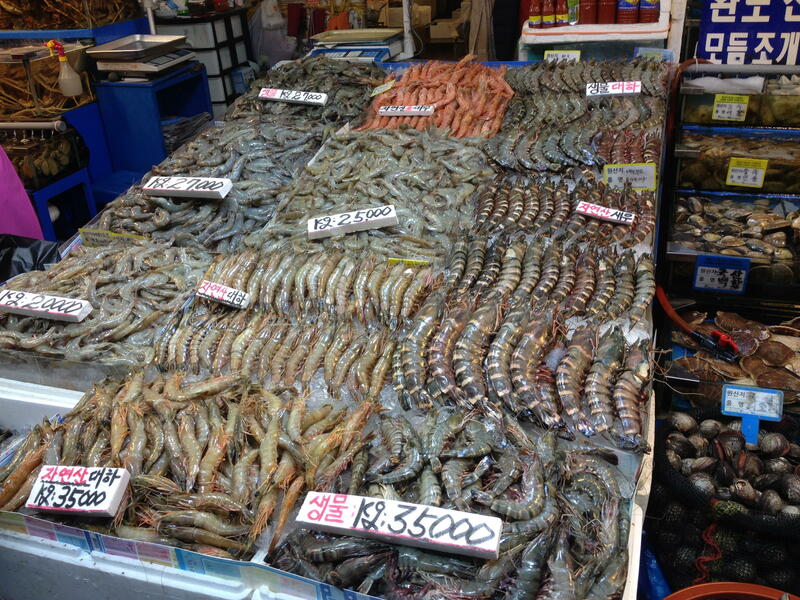 “Giant prawns” is a difficult term… in Spain, there was a term for each, from the smallest shrimp to the largest prawn. But in English, I guess giant prawn will have to do. Anyway, here are all the pics from above + a few more…. 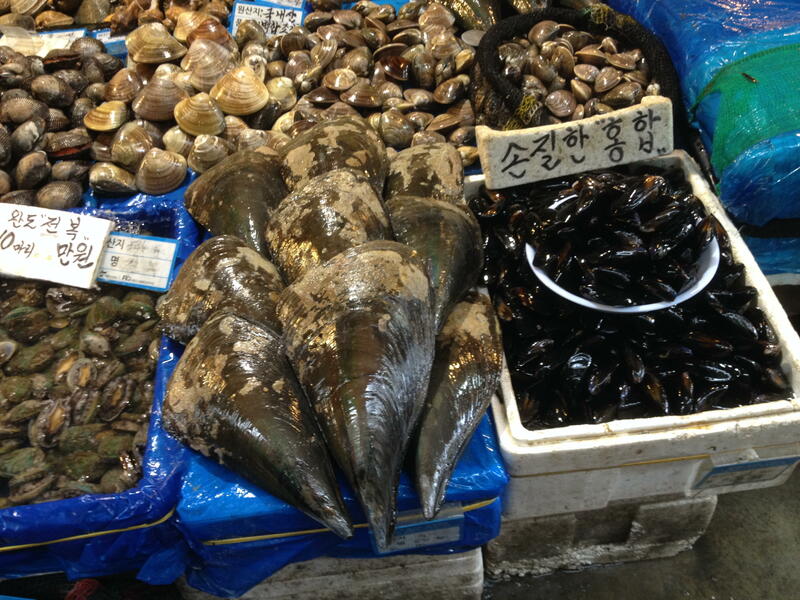 Thanks for citing my article on how to visit the Noryangyin Fish Market in Seoul (http://independenttravelcats.com/2014/05/29/fresh-fish-breakfast-noryangjin-fish-market-in-seoul/) . Many have found it helpful in planning their trip to this market. Sounds like you had a great time as well!